Happy April! Below are a bunch of things I loved and used throughout the month of March. I’d love to hear your faves! I have read a ridiculous amount in the last few weeks. I ended up going down the Colleen Hoover rabbit hole and even though I normally do not care for most young adult books, I really loved Maybe Someday. Her characters are so well written that it blows my mind. It’s so inspiring and at the same time completely intimidating because I’m like, how could I EVER write a character so complex? I also really liked Swear on This Life. What are you reading now?! Hummingbird Glass Straws. We’ve had stainless straws for a few years, but I hate that I can never really see in to tell if they are clean or not. I found these straws after watching Catherine’s smoothie snaps on instagram (they are so inspiring!) and love these. They come with a little brush to clean them too! Pitaya Plus packs! Speaking of, we are back on the smoothie bowl and smoothie train bigtime. Max loves them so much. Pitaya is definitely my favorite ingredient (hello neon pink) and I buy mine at Whole Foods. It’s so good! I can’t believe I’m going there, but my favorite show all month has been GIRLS. I know I’ve ripped the show apart since it’s been on and have basically hate watched it since day 1 (I can’t stop!) but I am just LOVING something about this last season. I can’t miss an episode. My next obsession is… socks. These no show socks by Stance to be exact. Eddie has worn Stance socks for a few years and I was really excited to find these no show ones for women. They are perfect for the Nike Juvenate sneakers that I love and also so comfortable. They don’t slip at all. Blank NYC Suede Moto Jacket in Pink and in Mint. Okay, so this is sort of cheating because you guys know that I love these jackets to begin with. Eddie got me one for Christmas and I love it so much. So! When I saw they had mint AND pink? I could not resist. I absolutely freaked out over them. They are so comfortable, work in all sorts of weather and just so nice. Just look at the reviews! I feel like a broken record because I mention this candle all the time, but the Voluspa Macaron is the BEST slightly sweet but not overpowering scent. I just bought a new one to burn while our kitchen is being remodeled and always forget how much I love this. I also think it’s the perfect spring scent in home! Raw Sugar Lemon Hand Soap. New Target find! This stuff smells like exactly what it says: lemon sugar. I’m obsessed with having this in the kitchen right now… even though our kitchen is currently down to the studs. Ed Sheeran’s new album, Divide. I love listening to his music because it always reminds me of right around the time Max was born. I’m also really loving this Big Little Lies playlist on spotify! 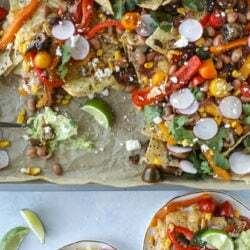 Veggie Fajita Sheet Pan Nachos. Love so many of these! My daughter is about the same age as your son and we love Pitaya Plus packs as well. And thank you for the Big Little Lies playlist (the music from this show is SO good). Loving Girls more than ever this season too! oh my, i can’t stop listening to ed. i;m convinced that “divide” is made of prom songs and irish songs, but loving all of it anyways. I have also hate watched Girls from day one and was convinced I didn’t like it, then last season I started coming around and now, like you, I am fully on board with this last season – I don’t want it to end!! Loving the glass straws too! So many good things on this list. Everyone loves that moto jacket. I don’t know what color I’d pick! The boring part of me wishes it came in black or navy, but the burgundy and pink are calling my name too. I’m currently reading The Likeness by Tana French. I recently read the first one, In the Woods. They are sooo addicting. They are murder mysteries so they can be a little ominous, but they’re not scary! YES Ed Sheeran’s new album. I maybe listened to it for an entire day straight on repeat two weeks ago–a little overkill–but now I miss it and think I’ll listen to it at some point today. I JUST had a conversation with my friend about Girls — I’ve not loved it until this season. I now look forward to Sunday evenings! I read It Ends With Us by Colleen Hoover in one day! It was the first book I read authored by her and I was hooked like I never had been with any books recently. Also, have you watched This Is Us? My husband and I are both really loving it. All the characters are super relateable and every episode gets better and better somehow. That Target soap sounds amazing! Well…now I’m going to be the owner of a pretty pink bomber jacket! Thanks for the new playlist — I was listening to Leon Bridges all last week on repeat. Oh my gosh – YES. You’ve made my day with the Big Little Lies playlist. Didn’t you love the show? Also – why must we say goodbye to GIRLS and Elijah just when it’s getting SO good? But… but… you don’t like socks? Do you? Ugh I’m so behind with Girls. You are the only reason I want to catch up again!